The DVD on “Fundamentals of Lubrication” covers the basics of lubrication through cartoons and high-quality video material. This video deals with proper training for teams based on the fundamentals of lubrication, and explains how to recognise signs of lubrication problems in time. The correct and proper extracting of samples is the first critical step to ensure success in the oil analysis programme. Without representative oil samples, oil analysis may just be a waste of time and money. This video shows how to design and implement a world-class oil sampling programme that will deliver the best results and help you focus on improving equipment reliability. Discover how to cut roller bearing failures and reduce down time. This video offers cartoons showing various types of roller bearings in electric motors and how to lubricate them properly. Get the most out of lubricant life and extend the useful life of machinery to the maximum starts by using a healthy, clean lubricant in the machine. This new video explains the best practices to ensure that this crucial aspect of excellence in lubrication functions correctly. 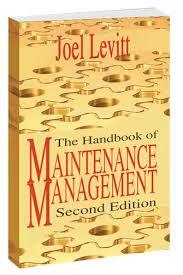 The goal of this edition is to provide a succinct, accessible review of all the major areas in the management of the maintenance function. 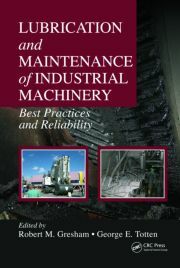 This book largely deals with knowledge based on reliability and maintenance management leadership, execution and practical tips. Topics include productivity, competitiveness, failure analysis, team work, organizational structures, key performance indicators, benchmarking, Reliability Centred Maintenance, implementation of world class reliability and maintenance practices. Lubrication and Maintenance of Industrial Machinery explains the key role of equipment lubrication with a reliability-based maintenance programme and the best practices for achieving cost reduction and increasing operational reliability. A manual that explains how to carry out optimum maintenance of hydraulic equipment. This edition provides an overview of the existing knowledge about the various aspects of grease lubrication (including lubrication systems) and the state of the art models that exist today. The book reviews the physical and chemical aspects of grease lubrication, primarily geared towards the lubrication of rolling bearings. This book will enable the reliability professional or lubrication specialist to understand the most important concepts relating to lubricants, and will help professionals to ensure that machinery operates at optimum performance levels, thus preventing, as far as possible, costly down-time. . This new revised and expanded edition deals with basic products, machine elements that require lubrication, methods of application, lubrication, lubricant storage and handling, and lubricant conservation. Routine inspection of a machine’s lubrication system is one of the easiest and most productive ways of preventing equipment failure. This book describes lubrication-related variables that can be quickly and easily monitored in a short timeframe. These inspections will be significant, and can serve as the foundation for an optimum lubrication management programme. The Practical Handbook of Machinery Lubrication – 4th Edition is a useful guide that answers all machinery lubrication questions simply. It gives understandable solutions and explanations on how lubricants work, what they are made of and how they break down or how to choose the correct lubricant, among other things. This book explains the use and application of dozens of methods that can be easily applied during inspection, maintenance and sample-taking tours. Step-by-step procedures for various on-site tests, like the membrane test for particle contamination, AN and BN tests, crackle test, the field viscometry procedure, etc. These study cards help candidates prepare for the MLA I, MLT I and MLA II certification exams set by the International Council of Machinery Lubrication (ICML). 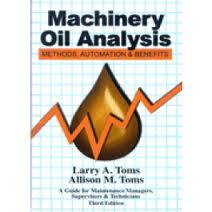 Oil Analysis Basics manages to make oil analysis for the monitoring of the condition of machinery easy to understand. It starts by explaining how to take an oil sample correctly and goes on to explain how to choose a set of tests for its applications. Industrial maintenance continues to be regarded as a factor in costs and expenses. But due to the significant effect of down-time for technical reasons, more and more is being invested in methods, processes, instruments and tools and diagnostics to implement and accompany the functions; this will increase the useful life of assets and lead to greater operational performance. The book explains how to interpret lubricant analysis results through a support method that allows the condition of the lubricant and its contamination to be diagnosed as well as the state of the machinery. The new ANALEX pqL is the latest development in the widely accepted ANALEX pq laboratory instrument range. Enhancements include greatly improved reproducibility at low pq levels (<25 PQ), reduced footprint, much faster (0.5X) cycle time and better auto-calibration. Accepts in-service oil and pre-prepared grease samples. Reports results in PQ Index and is suitable for connection to laboratory LIMS systems and remote operation. The icountOS Oil Sampler (IOS) is an innovative solution to the challenge of measuring the quality of hydraulic oils and hydrocarbon fuels in many different applications: from renewable energy, marine and offshore, to manufacturing, mobile, agriculture, military and aerospace. Compact, lightweight and robust, the truly portable IOS makes field analysis simple, quick and easy. icountBSplus is a unique and complete solution providing customers with laboratory fluid bottle sampling using proven on-board, laser based technology. The icountBSplus is a next generation product fluid particle analysis and monitoring programme and provides an effective alternative to external laboratory services. These oil test kits will identify most major problems in time to limit major damage. They will give you comfort that the oil is fit for use and system free of major contamination. Hand-held condition monitor provides a visual comparison between new and used oils. This condition monitor is completely portable and battery powered with a numerical display that indicates positive or negative increase in dielectrics. Also gives an early warning of impending engine failure and the simplistic hand-held design makes it easy to use. In Beta Test Currently under field evaluation, the viscosity sensor measures dynamic viscosity On-Line and is unaffected by orientation, pressure (within common ranges) and localized vibrations. Capable of operation over a large dynamic temperature and viscosity range. Due for release Q1 2014. Probably the most sensitive instrument in its class, detecting >40 micron ferrous particles. Detect, size and count ferrous and non-ferrous debris particles generated from fatigue, spalling and running wear. Crucial insight in to the wear process at your fingertips. Continuous Monitoring with a proven track record in wind turbine and oil field applications, also available with ATEX approval for use in explosive atmospheres. An on-line optical sensor which measures the degree of degradation of lubricating oils. The Bulk Systems are the most feature rich and highest quality lubricant storage and dispensing system available today. They are perfect for any workplace looking to instantly establish best practice in cleanliness control. The Ultraprobe® 201 Grease Caddy is uniquely designed to allow an operator to si-multaneously lubricate and monitor ultrasound levels to prevent over-lubrication. Consistently & precisely samples oil, VG 32 to VG1000 without shutting down. Samples up to 5 times faster than BT series valves. Avoid accuracy errors of drain or drop tube sampling caused by sedimented or settled oil. Installs compactly into drain, fill or custom ports of gearboxes, reservoirs, drives, axles or lines. Flexible tubing provides full flow with low purge time. Label Safe Colour-Coded Drum Rings fit securely and easily to all Containers and provide clear and effective colour-coding. Featuring the same functionality as the basic cart, this cart also enables you to transfer the 55 gallon drum with you. Excellent for dispensing oils into or filtering oils out of equipment. Available standard with 6 different pump/motor combinations including direct mount and diaphragm pneumatic pumps (varying the air pressure controls flow rate in range of 0-10 gpm). This feature rich filter cart delivers the extra functionality required to better control the filtration process and includes longer filter elements that process 3-4 times the amount of oil and contaminants than the elements on the basic cart. These pistol grip grease guns feature both a 12″ flexible discharge and a 4″ steel extension and are ideal for one handed operation and are designed for use in confined spaces where access to great fittings is restricted. No need to remove the lid. Configure the Premium Pump for operation with quick connects. This enables the container to be filled by quick connect through the pump body (no need to remove the lid) and also enables attachment to machine refill points by quick connect via the pump discharge hose. No mess, no contaminated oil top ups. Discharge hose (available in two lengths) with ¼” NPT Male adapter. For fitting of your preferred female quick connect. ¼” NPT Male adapter for pump return port. For fitting of your preferred male quick connect. 10 µ Breather fits the Premium Pump accessory port providing contamination free air intake when using Quick Connects. Note: Does not come supplied with male or female Quick Connects. For on-site fluid storage and transporting applications. Available as replacement 1.5 meter hose or in a 3 meter version for when longer reach is required, these discharge hoses screw easily to Standard and Premium Pumps. Anti-drip hose outlet – for discharging lubricants into open fill points 12 mm and larger. Available in 1.5 meter and 3 meter. Custom lengths available on request. ¼” NPT Male end – for fitting quick connects. Available in 1.5 meter and 3 meter. Custom lengths available on request. Suits both standard and Premium Pumps. The accessory fits the aluminum anti-drip discharge pipe on the outlet end of the pump hoses and reduces the diameter down to approximately 6.5 mm, making oil top offs to very small fill point easy simple fast and clean. Feature rich and will handle up to ISO 680. The premium pump is a heavy duty with fully serviceable internals for maximum life. Supplied standard with a 1.5 meter anti-drip outlet discharge hose and Body Collar, this pump can also be easily converted for quick connect use. Quick connects enable the container to be filled through the pump body (without removing the lid) and also enables attachment to machine refill points by quick connect via the pump discharge hose. Quick connect kits and replacement parts are available. It is matched with the Utility Lid and 10 Littre drums. General-purpose pump will handle up to ISO 460 fluids. Supplied with a removable discharge hose for easy cleaning and drainage, the pump delivers 1 litre for approximately 12 strokes. It is matched with the Utility Lid and 10 litre drums. It is supplied with a 1.5 meter Removable Discharge Hose with a hook outlet nozzle. The anti-drip nozzle is made of aluminum and fits 12 mm or larger fill holes. For smaller fill applications add a Pump Reducer Nozzle accessory to the outlet hose. Fits the stretch and mini spout lids hose extension to help with awkward or hard to reach fill points. Quick twist spout is easy to open and close. Controls flow and keeps dirt out. Push button auto-shutoff air intake enables smooth pouring of lubricants. See-through drums with graduated markings make it easy to see and measure liquid levels.